Ponzi Scheme - What Does It Mean? 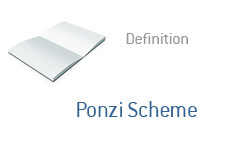 The "Ponzi Scheme" is named after Charles Ponzi, an Italian immigrant to the United States who died in 1949. Ponzi swindled millions of dollars from Americans in the early 1900s. A "Ponzi scheme" is a fraudulent operation that lures new capital via the promise of outlandish and unrealistic profits. There are actually no profits - old investors are simply being paid off by the inflow of new investor capital, while the perpetrators of the fraud are stealing money for their own benefit. Example: A "Ponzi scheme" is operating in a local city. A well-spoken gentleman has called you on the phone, offering you the chance to make a "guaranteed" return of 45% in just six months. Little do you know that this scheme has been in operation for a while now, and your investment will simply be used to pay off some of the older investors in the scheme. Why would a Ponzi scheme bother to pay off the older investors at all? In order to swindle a truly staggering amount of money from a large number of people, the "Ponzi scheme" needs to generate some positive word of mouth. This is done by paying off the older investors in the fund according to plan, who will in turn tell their friends and associates. This will result in a major inflow of new money into the scheme. Example II: Bernard Madoff ran what is reported to be one of the largest Ponzi schemes in history. Estimates put the size of the losses at as much as $50 billion dollars. Madoff lured in new money through false returns. Word quickly spread that Madoff was able to generate a return of 12-13% in any type of a market, and billions of dollars poured into his company. Banks, hedge funds and high net-worth individuals were all taken by the scheme. He paid out old investors with new capital, which resulted in the older investors in the company spreading the word about what a genius Madoff was. Billions poured in, and billions will end up being lost in the scheme. Bernard Madoff Speaks Out - "They Had To Know"